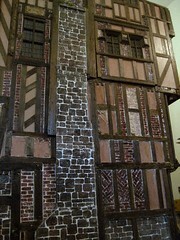 I’ve found a number of variations online of the Dolls House Emporium Market Cross; doors cut into one of the walls with steps up, a double-decker one (that must weigh a lot), a number of gothic and faery ones and a mention in one of DHE’s chat pages of a fallen Market Cross that broke apart and had to be rebuilt. In the market area there’s been further work done towards the fixing of a central pillar using an old balsa wood chimney base I made when doing Hogepotche Hall and a piece of dowel. Looking for more wall and roof avoidance action I’ve built the steps which turned in to a combo of half a ladder and a few ‘stone’ steps. I made the decision to go for light-weight materials up above. The construction looks quite delicate at ground level and I’m not surprised that it can fall apart with all that weight up above. Besides which, the ring of walls is more or less put on as a ‘oner’ which would mean more weight and a longer stretch than I could manage and it would be a good idea if a repeat of the sandwich incident could be avoided. There’s something about the steep angle to the pinnacle like a castle turret roof that doesn’t sit well with me. I’d like to go less with aspiring to the skies and more with a drum shape that sits firmly on the earth I think. To that end I’ve been doing work on the walls and roof of the office space. I’ve done two or three runs through with different materials for walls and some roof sections. These remains look rather like collapsed and abandoned beach huts, don’t you think? 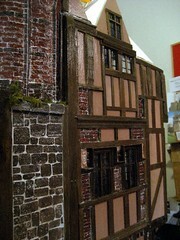 Some of the pieces are the same size as the kit, some have added gable bits and some have a combo of lower walling alternating with a gable or two or four, or on one build, a gable for each of the eight walls – which made it look like a fairground ride. Am now leaning towards foam board walls for thickness so that they give a wall head for the roof slices, and grey 2 mm card for the roof. Both walls and ceiling/roof pieces will be sandwiched with wood and card to limit warping. Well, this is proving more or less guess-work and not just because I’m usually so inaccurate. There is an inconsistent variation between the sides of the octagon of between 2.5 and 3 mm, as I found to my cost when fitting the high level spacers at the top of the pillars and then the roof of the sandwich together. These mini variations are in where the outer ledges for the walls have been routed out and also where the dowel holes have been drilled. It’s such a small amount that doesn’t matter with the beautifully cut kit walls and roof, but it matters a lot if you’re as silly as me and cutting fresh pieces from less chunky materials. It’ll be what it will be and fudging seems to be my ‘thing’. Today is the day to have a more serious play with four gables (like a cross), shorter walls all round, shorter pixie hat roof pieces too, with the addition of a half-inch overhang beyond the wall head. 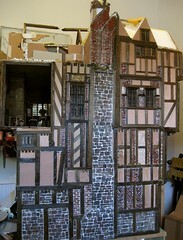 I’d like to try to work towards an attempt at an opening method using two side walls and a section of a couple of roof slices as I’m interested in opening up the view of the upper room in some other way than lifting off the hat as is intended for the kit. I’ve got nothing against house reveals from above, but in this particular case the kit has you take off the lid (the whole roof) and you miss out on a view of a room with a lovely ceiling shaping. That I think would be a shame and I’d like to avoid it if possible. Also I’ve added a continuation of the pillar theme to hold up the centre of the roof and provide a place for the market super to hang his satchel or fix a torch perhaps. I’m always looking for places to knock in a few nails. Are those ears sticking up? Hmm, not keen on the four pointy bits as looks to me even more pixie-fied than before; will probably go back to two gables one at each end. It’s a good time to consider any lighting for this convoluted room. For this I’m going to experiment with a home decoration string of battery-powered LEDs, you know, the ones you see wound round inside a glass bowl, in the hope of achieving a general lighting downwards over the white walls of the office space. If I shape the beam pieces at the base of the ceiling pieces to be flush and leave the gap that will cause at the wall it might leave enough space to slide some of the string of lights behind, perhaps. How ever messy the room shape and roof may look it would be sad lose a view of the beams that will be added, don’t you think? 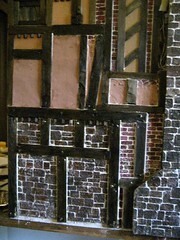 Still making doors by a sandwich process with some form of card in the centre and paint and cladding on the faces. I do like the door knobs to sit opposite each other, but with the door structure being fairly thin, that can be awkward as most pre-made knobs have useful necks on them for inserting in the door surface I presume, but they are too long to put opposite to each other. If I surface mount them they never stay on, not even with a bit of a pin in them. I find it easier to chop it off and fit the knob closer to the surface. I make a small hole through the door and insert a sequin pin in one of the knobs to go through. Then I chop the pin to suitable length and stick the other knob on the pin that sticks through – just the same as with a real door with spindle. And I glue the whole lot. 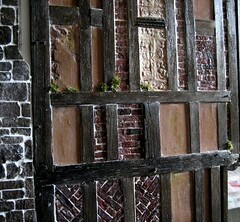 The card and cladding make for a bit of a rough door, I know but it does a job until I can muster a better finish. Couldn’t get the mind off what would need doing to boost the first attic space lighting so, as getting nowhere with everything else, I turned attention to that and dragged out an LED light from the stored electrics that are squirreled away. It’s a ceiling light from Heidi Ott but if you invert it you can get something else, possibly. How safe is an oil lamp do you reckon? I forced it to roll up a little (not as rounded as would like) and inserted a piece of lighting gel inside, all to make a bit of the look of a lighted oil lamp. Making sure that there are enough extensions/leads/sockets for the lighting that has still to be added while I’m working on the upper landing and eventually that bathroom. “All roads lead to …” for the upstairs wiring, (and the downstairs ceiling light) exiting either under or over the upper hallway and out to their plugin point via the bathroom cupboard. 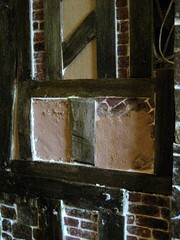 This upper space is entirely enclosed and internal to the structure so it can only be viewed through doorways. My first intent was to give it a ceiling light or another wall lamp so that they all matched up, but I took a sudden fancy to a side table and lamp in the corner by the end of the banisters. The lamp itself is not v period but it does the job nicely, throwing a warm light on to the scene. Time to get the remaining door surround on and put down the carpet and landing rug. Hoping to get these items done before the hols. Then it’ll be an attempt at “full steam ahead” with the bathroom.